Kate Peterson Team 5th “Annual Flowers For Food” Food Drive! 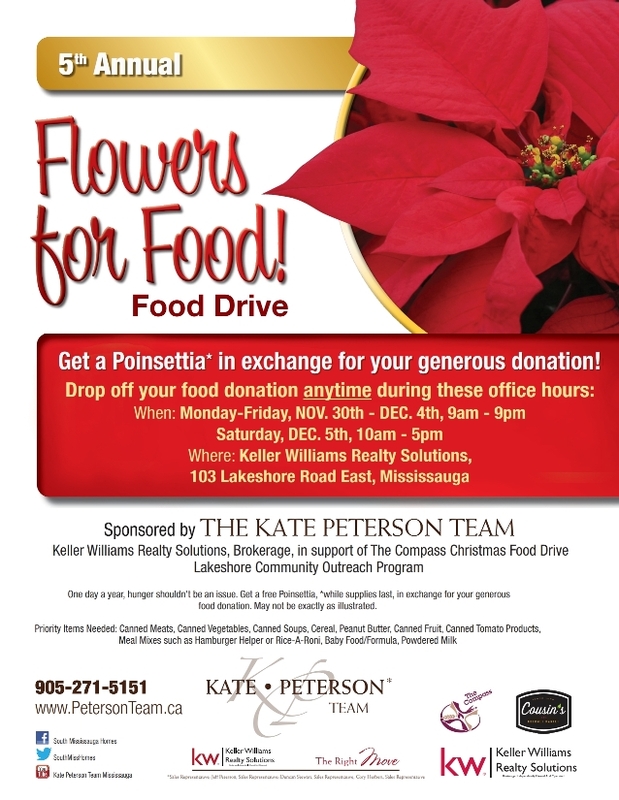 For the fifth year in a row, the Kate Peterson Team is proud to announce its Flowers For Food Event to collect food in support of the Compass Christmas Food Drive. Each year at this time, the Kate Peterson Team and local student volunteers hand out free poinsettias in exchange for food donations. This year the event will be held from Monday, November 30th to Saturday, December 5th at the Keller Williams Realty Solutions office at 103 Lakeshore Road East in Port Credit. Contributors are invited to drop off their donation of non-perishable food items to this location between 9am-9pm Monday-Friday, and 9am-5pm on Saturday. We hope you will help us out with this worthy cause! If you’re craving a fresh view of the lake, Port Credit is the watery jewel of Mississauga. Here’s something that we definitely wish we’d noticed a few months ago but the suggestions offered would suit a fall trip as well (well, sans any reference to patios).